Much of the thrust of the diverse Gilets Jaunes movement is equalitarian. But a range of demands, for the resignation of ‘oligarchical’ President Macron, a fairer state system, better public services, and lower taxes, to an end to gay marriage, a halt to usury, and looser speed restrictions, have emerged and been debated on-line. The French state while trying a ‘national debate’ has reacted with heavy-handed violence. On the Gilets Jaunes side thuggish confrontation with ‘fake news’ journalists, has disputed the right of the media barons to broadcast views different to the Gilets Jaunes. It is hard to see Rancière’s frequent calls, for “des formes autonomes de discussion, des formes autonomes de décision” reflected in support for government by continuous referendum. Has the force of egalitarian freedom has cropped up again, though not perhaps always in a way that all egalitarians would admire. Defending these “ignorant crowds” from the elites are a variety of self-appointed left and right populists, from Jean-Luc Mélenchon to Marine Le Pen. Some have supported their views with detailed pictures of the ‘left behind’, la France péripérhique – an attempted sociological fixture far from his taste for disruption. But many more, from RT to demonstrators, share Rancière’s belief that most of the West is dominated by a simulacrum of democracy. We shall see what impact the Gilets Jaunes Electoral List for this year’s European Elections has. Polls already indicate a score just into double figures. Many of Rancière opinions are now intelligible to mainstream commentators. Given the often extremely abstract character of his writings, this is an achievement. The aim of this article is to indicate that while he has raised important issues, and made some interesting contributions to thinking about politics, his ideas are flawed and offer little to left politics. Rancière, with all the baggage about elites, plutocrats and oligarchs, and anti-institutional democracy, represents one of the stumbling blocks holding back the creation of a left able to grapple with ‘populism’. Rancière’s background is complex. One journey began with a long detour through Althusser’s theory that his brand of Marxist interpretation revealed the “truth” of the continents of history and class struggle in philosophy. (La Leçon d’Althusser 1974). From attacking this “philosophy of order” Marxist Leninist theoretical practice fell apart as Rancière developed a thorough-going assault on the academic establishment. Perhaps the most significant first step was La Nuit des prolétaires (1981). This tried to undermine the pretension of historians to represent the self-affirmations of the diverse working class as a collective culture. A brush with archives relating to Parisian workers in the years between 1830 and 1840 opened up new prospects. Utopian systems offering a “community of goods”, the voyages of Icarian egalitarian communism, or Saint Simonian doctrines for the Producer are the objects of many brilliant studies. But the worship of Le Nouveau Christianisme, around the Saint-Simonians, Amand Bazard (1791 – 1832) and Père Enfantin (1796 – 1864) was a lot more than an affair of the Priests and hard-core believers. Rancière offered only a sketch of the radical writings of the period he covers. This included thinkers, such as Abbé Félicité de Lamennais, or Victor Considerant, and radical ‘communist’ republicanism in the tradition of ‘Gracchus’ Babeuf. But he had the merit of making Saint-Simonian and Icarian utopian thinking alive through this vivid portrait of early 19th century independent minded workers. Rancière did not work alone. He was part of the collective and journal Révoltes Logiques (1975 – 1985) Révoltes Logiques had a broad range. After tackling the condescension of social historians, Rancière’s essay in the collection l’empire du sociologue (1984) undertook to demolish the way sociology patronised its objects. The charge was that sociology in France had become a powerless Opposition, poking away at the facts of social inequalities without any effect on them. Fresh from these efforts to undermine the Scholars of the Republic Rancière turned to questioning the authority of Education. Its founding principle put the Teacher above the Ignorant. His book on the early radical pedagogue Joseph Jacotot (1770 –1840) Le Maître Ignorant (1987) took developed the theme. This luminary of the natural parity of intelligence was – by his own account – successful in getting non-French speaking students at the University of Louvain to grasp a French classic, Fénelon’s didactic romance, Télémaque (1699), with some help from a Dutch parallel text. At the end they were, to his self-reported astonishment, able to write in French, without his help and explanations. After this remarkable feat, it is no less easy to accept that this was achieved without formal instruction in French orthography and grammar. Rancière set himself up as a “disciple intemporel”, an imaginary student in this class. In his reports, mingled with the Jacotot’s wisdom, enlightened Schooling dispensed with the assumption of Superior bearer of knowledge facing the Ignorant pupil. (Le Maître ignorant). People, Jacotot affirmed, were capable of their own instruction, “seule et sans Maître”. Some may have perhaps noticed that Fénelon sought to impart ready-made lessons, morals of the tale, in Télémaque with the aim of instructing others. Those who have read it generally only remember that it was a critique of arbitrary and absolutist Monarchs with some utopian speculation on the hierarchical communism of the imaginary city of Salente. Rancière put into question the nature of the Authority to articulate and classify the voices of others. The hierarchies this set up moulded society, not just research. When social actors attempt to form a collective, an autonomous “troupe”, there are always those who wish to direct them. Political practitioners try to mount a “mise en scène” in the Theatre of History. The political stage is filled with players who try to don the mask of social groups; attempting to spin the world into a “plutocratic consensus”. Established elites are not the only ones who try to direct this “theatrocracy”. This string-pulling is a template anybody can use. Rancière has stood all ventriloquists of the People’s Voice. Radical ideologues and parties attempt in their own fashion to write the script of historical actors. They have their own qualifications to determine who shall speak and who shall not. There is a would-be Professor Henry Higgins behind every proletarian Eliza Doolittle. Not unlike, one has to observe at this point, the efforts to instruct the Pygmalions of the People by Populists of Right and Left. The Philosopher and the Poor. Rancière’s critique of political philosophy began in parallel to his writings on intellectual emancipation and historical explorations. His next stage was a critique of philosophy and politics. In The Philosopher and His Poor. (1983/2004) an introductory “personal itinerary” outlines his concern with the relation between the “order of thought” and the problem of social order, “as harmony or rupture”. He had been, he addressed the audience, inspired by an interest in how representations of the self and others sustained “hierarchy, consensus, or conflict” and the ways they had been “formed or transformed”. Many of the answers to these questions lay in the writings of early philosophy, in classical Greece. The Philosophy of Plato occupies the first sections. The Philosopher commences with Plato’s belief that the Cobbler, the artisan citizen, should stick to his Last and not be concerned with affairs of State. Breaking already well-ploughed ground Rancière seized upon this Principle of Specialisation. It places the Self within a pyramid of moral order. Only some beings have the gold to make the grade for moral knowledge. Those stamped by baser metals, the “disguised slaves” who are artisans, cannot enter the realm of philosophy. Plato’s fable of the Republic imagined a City of Order. It was a programme for communism “removed from the logic of work and property” It was a dream of rule by a caste of golden communist philosophers. The book is a hotch-potch – far from helped by Rancière’s convoluted prose. Sartre, in sections which defy common understanding, is taken to task for a variety of faults. These include a “parasitic dialectic” a reflection, he alleges, of Stalinist rhetoric about the danger of “petty bourgeois” elements at work in the 1956 Hungarian uprising. There is something about the “Spinozist denunciation of representation, the free movement of matter, that subjects of history would not have to modify with their parlour games”. Sociologists like Pierre Bourdieu are, one had guessed without feeling the need to inquire further, “Sociologist Kings”. There is little in this summary dismissal to add, that is, to his more considered polemic in L’empire du sociologue. The claim that this work inched a step forward in explaining consensus, conflict, hierarchies and the presentation of the Self is a bold one. It is only justified in the sense that Rancière showed that his targets were conflicted, inclined to believe the world should bend to intellectual authority, enjoyed a consensus they agreed with, and put their Selves at the forefront of their works. The way in which those “Worthy of command” wish to dominate society and deal with, or try to eliminate, political disorder, could be said to presage the later focus of Rancière’s work. Yet there is no effort made to demonstrate how exactly they influenced any historical pyramid of command. His next step was to turn from the pretensions of influential philosophers to his own claims about the mechanisms of power, and politics, in the modern world. From Democratic Dissensus to Consensus. After The Philosopher and his Poor, there was Disagreement (1995/1999). Plato wished to eliminate politics and replace social norms by the natural order, something he called “archipolitics”. This refers to form of thinking in which the spirit of the Law, a living Logos, transmitted through education, should take the place of legislative deliberation. The classical Greek philosophers’ ideal of rule by the Best, did not have much of a bearing on the world itself. Aristotle recognised this. He opened up a much more influential practical approach to political life. Aristotle is – commentators observe – entrenched in Rancière’s writings. He was, it is argued, the original thinker of this “para-politics”. This unlike the stifling ‘archipolitics’ is an unstable mixture of democratic tumult and efforts to eliminate politics. Aristotle, by contrast with Plato, saw that considering the City as One Soul in which everybody should assume their rightful place, did not fit human Speaking Beings. Politics, the characteristic of the human animal and foundation of the City, rested on a natural equality. That is, the capacity of speech, being able to say what is wrong and right, good and bad each from their own mouth. In this human were distinguished from animals whose cries were purely instinctive reactions to pain or pleasure. Rancière denied the right of political philosophers to speculate on the nature of government on the basis, one might simplify, of abstract theory. These outlines of the operations of Power and Governmentality might mislead the simple-minded reader – one can picture Rancière’s wry smile! – to take this as social theory informed by empirical study. But, Rancière is concerned with concepts illustrated by a few examples. The Police, regulating social positions (in the broadest sense), the Law, an “order of bodies”, traffic regulators for the people, is bound up, today with the politics of humanitarian intervention, a proto “World Police”. Rancière separated, following a distinction popularised by Claude Lefort, le politique, the forms of command and administration, in which the police is key, and la politique, the dissensual waves rocking them. Where this power comes from, its material basis, its embodiment in regimes of government, its ‘micro-powers’ (to use Foucault again) is left hanging in the air. We might as well call the Police Dixon of Dock Green. We barely notice his reassuring presence. Except when we do. Rancière has produced commentaries on the “suppression” of dissensual conflicts that spring from the “surplus”, the Part of those with No-Part – the “elite” hatred of “democracy.” In La Haine de la Démocratie election through the ballot box, is itself considered an “oligarchical principle” – at the root of elite consensual dominance. Amongst his afterthoughts Rancière noted that the fight for universal suffrage, even in Britain, had often been stained by blood. The result, Parliamentary Monarchy, is a “mixed” system. Nevertheless the oligarchy, at least in his record, has turned every democratic struggle to its own advantage. That is, there are many factors that make proletarian protests emancipatory but not simple bread and butter interests. Neither is a ready-formed identity, forged in the factory or mill. It was crying out, on the basis of a universalism that had no specific home, a nowhere that is everywhere that broke the bonds of the Police order. A politics based on furthering the interests of existing classes, class struggle, accepts the function and distribution of roles in a given society. Emancipation, universalism, is a break with this set up. The proletariat is the symbolical class of the non-class. Those with familiar with the Leninist gloss on Kautsky, that the working class on its own creates mere trade union reformist ideology, will find a twist there. Only the symbolic identity as ‘proletarian’ escapes the trap of falling into the hands of the Police and eventual absorption into the consensus. Those who will have not skipped the dense and abstract passages cited above – representative of Rancière’s writing then and now (they barely differ in the French original) – may have noticed another point. Throughout Rancière’s writings there is a studious avoidance of the most dissensual politics of all, the point at which disagreement destabilises the state. That is, Marx’s “locomotive of history” – revolution. A few sorties against Marx’s “myth” of the old mole of revolution, a longer discussion on the reams of books alleging that the French Revolution was the origin of ‘totalitarian democracy”, and a dismissal of Marx’s alleged ‘meta-political’ call for a post-political world of communal harmony, put to one side, there is a void. Many thinkers have thought about the “unsocial sociability” of human beings. If revolution is one aspect of how dissensus can lead to violent upheavals war itself is an issue. The history of ancient Greece is probably all the more familiar for the record of bloody civil strife. The best-preserved recorded speeches in favour of Athenian democracy, by Pericles (500 – 429 BCE), are concerned with war against external enemies. It is hard, looking at the conflicts of the last century and the present day, genocides and genocidal regimes, to dismiss the issues dissensual human violence raises. It is difficult to see the link between the genocides carried out by ethnic and religious nationalists, armed Western intervention and the actions of NGOs wishing to bring aid to the suffering. There is a point where theoretical political rhetoric descends into the gutter, and Rancière reached it here. Bruno Bosteels remarks that “all of Rancière’s work is meant to break down the normative claim and hierarchical pretence implicit in the notion that any one person or class of persons would indeed have a lesson to teach to any other person or class.” Nevertheless he clearly does have a number of “lessons of equality” is to teach. Foremost amongst them is the course on equality. That is the way in which those who are not counted in politics assert their right to speak. What we are presented with is an anti-Leviathan. The Police, the Oligarchy, are faced up to by the masses, sneered at for their “populist” demands. Enter the drama of Equality, the demos, the free play of the passions, the assertion of that unseizeable moment, carried by no historical necessity. The ‘scandal of democracy” rocks the oligarchs. We do not know exactly what oligarchs are, any more than we do about their other names, “elites” “plutocrats” but we know a lot about how they rule. Rancière tells us that the demos will (or should) never, never, demand guarantees from any “forme institutionnelle”, nor place any hopes in them, The oligarchs are always there to turn their acts to their own advantage. It is hard to take full measure of the reach and scope of Rancière’s ambitions. He has stated that his arguments are a “few pointers” at the “aporias” in political philosophy He denies that he has far-reaching goals, only to turn round and extend the field of operations, from the struggle of the part of the no-part to the critique of the World Police. The highly educated radical may find this of interest. But this is not the core of the thinker’s importance. Rancière, as he would be the first to admit, knows something about disagreement, and about how the ‘elites’ denigrate the masses. He has written about oligarchies and elites, above all in La Haine de la Démocratie, in ways which are now commonplace. He has expanded the idea of democratic struggle. He has spoken of the ways in which people contest their station in life that echo the diffuse ways in which popular revolts have emerged over recent years. Yet the writings on populism failed to anticipate just how “molar” (whole) the present-day image of the Oligarchy has become. From attacks on critics of the unruly people, anti-anti-populism, his writings veered towards some of the most contestable populist themes. The picture of an ‘oligarchy’ grasping not just political power but wealth, and capable of mounting consensual tricks to ward off dissent, is closer to the conspiratorial portrait of “post-democracy” than perhaps he might care to admit. This radicalism locates class injustice in politics, not that of workers’ interests and certainly not in capitalism. It makes fights against class exploitation invisible except when it takes shape around the ‘oligarchy’ Perhaps government, the Police, has many faults, but private profit goes into private hands, and wages, at least for many people, are not state allocated. Nor indeed would every modern radical agree that elected representation is a closed monopoly of a ‘caste’. There would be little point in populists standing for election if it were. Populism is also a problem – it certainly is for the left. Is hatred of democracy, by which Rancière meant loathing for his own concept of democracy, confined to elites? Does national populism also include dislike for egalitarian principles, promoting ethnic and national differences? How Rancière would treat populist government remains to be seen, but one thing is clear. Despite offering many thoughts on equality, he has yet to indicate how an egalitarian movement can change society and politics once in power. Page 16. Jacques Rancière Disagreement (La mésentente) Originally published as La Mésentente: Politique ET philosophie, 1995 Editions Galilee. 1999 Translated Julie Rose. University of Minnesota Press. Page 303. In La contre-démocratie. Pierre Rosanvallon. Seuil 2006. Rosanvallon states that Rancière was probably the first to use the expression “post-démocratie” in La Mésentente (1995). On ‘elites’ paternal concerns Page 123. Chronicles of Consensual Times (2010), tr. by Steven Corcoran. Continuum. Page 113. Jacques Rancière Disagreement. Op cit. France Culture. Jacques Rancière : Quelle égalité de la parole en démocratie? On the impossibility of imposing unity on a history of diverse working class and popular voices and the editorial strategy of les Révoltes logiques. », préface à l’édition des Scènes du peuple, en 2003 Cited in: Page 82. David Amalric et Benjamin Faure : « Réappropriation des savoirs et subjectivations politiques : Jacques Rancière après Mai 68 » Dissensus. No 5. Mai 2013. This is Rancière’s summary, looking back at Les Nuits, Pages 5 – 6. A coffee with Jacques Rancière beneath the Acropolis January 2018. I personally, being there at the time, do not recall any particular greater centrality about popular history in the 1980s under Mitterrand’s Presidency. Like the British and other European lefts this has always been a central, and valued, theme amongst the French left. L’éthique de la sociologie in L’Empire du sociologue. Collectif Révoltes logiques. Editions La Découverte. 1984. In the Preface to the English Edition, “Staging the People” op cit. Page 51.The Philosopher and his Poor. Jacques Rancière. Translated John Drury, Corrine Oster and Andrew Parker. Duke University Press.2004. Sentences from Pages 91, 93, 99, 105 164 The Philosopher and his Poor. Pages 127, 217.Page 121. 291 The Philosopher and his Poor On training the workers for their roles see notably. Pages 102 – 121. Philosopher Op cit. Page 16. .Rancière, Disagreement (La mésentente) Originally published as La Mésentente: Politique et philosophie, 1995 Editions Galilee. 1999 Translated Julie Rose. University of Minnesota Press. The principal reason to cite the original title is the word Mésentente, as its contrary, familiar English, entente implies, has a number of connotations beyond disagreement, including dispute.. Page 11. Page 35 Dissensus op cit. The point about John Locke is made in Sophisticated Continuities and Historical Discontinuities, Or, Why Not Protagoras? Eric Méchoulan. in History, Politics, Aesthetics Jacques Rancière Gabriel Rockhill and Philip Watts. Duke University Press Durham and London 2009. Page vii. Op cit. Preface. Page 28. Page 27 Dissensus. On Politics and Aesthetics Jacques Rancière. Edited and Translated by Steven Corcoran. Continuum. 2010. La Haine. Op cit. Claude Lefort. The Political Forms of Modern Society Bureaucracy, Democracy, Totalitarianism. Edited and Introduced by John B. Thompson 1986. Polity Press. Hannah Arendt. On Revolution. 1990 (1963) Giorgio Agamben, Stasis. Civil War as a Political Paradigm. Translated by Nicholas Heron, Edinburgh University Press. 2015. See also: Giorgio Agamben. Homo Sacer: Sovereign Power and Bare Life Trans. Daniel Heller-Roazen (1995) Page 278. Relire la Révolution. 2016). In it he dismisses one of Rancière’s few remotely feasible proposals. That is, a return to the Athenian practice of assigning political office (effectively judicial officials) by lot. Miller calls it an aesthetic “posture” Page 278). Rancière’s reflections on allocating public posts by lot (‘tirage au sort’) are on Pages 49 to 51 in La Haine. Op cit. Page 46. Chronicles of Consensual Times (2010), tr. by Steven Corcoran. Continuum. Page 168. Communists without Jacques Rancière. In The Idea of Communism. Edited by Costas Douzinas and Slavoj Žižek. Verso 2010. Page 93. 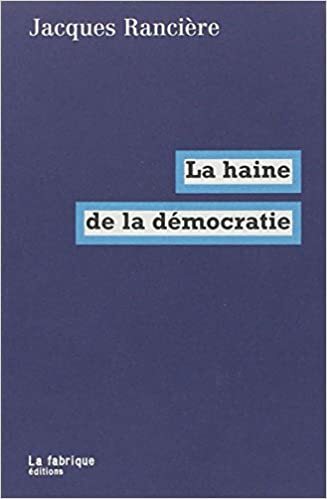 La Haine de le Démocratie. Structures et affects des corps politiques. Frédéric Lordon. La Fabrique. 2012. Page 38. Anders Fjeld. Jacques Rancière. Pratiquer l’égalité. Michalon Editeur. 2018. Steven Corcoran. Introduction to Dissensus. Dissensus. On Politics and Aesthetics Jacques Rancière Edited and Translated by Steven Corcoran. Continuum. 2010. Page 171. Rancière’s Leftism. Bruno Bosteels. in History, Politics, Aesthetics Jacques Rancière Gabriel Rockhill and Philip Watts. Eds. Duke University Press Durham and London Sophisticated Continuities and Historical Discontinuities, Or, Why Not Protagoras? Eric Méchoulan Pages 56, 60 also in History, Politics, Aesthetics Jacques Rancière. Rancière’s Leftism. Bruno Bosteels. Op cit. « ‘Gilets Jaunes’ List to Stand in France for European Elections.